1) Anti-nuclear exhibition "From a Culture of Violence to a Culture of Peace: Transforming the Human Spirit"
This exhibition presents the nuclear weapons issue through the lens of human security and places nuclear abolition at the heart of building a culture of peace. 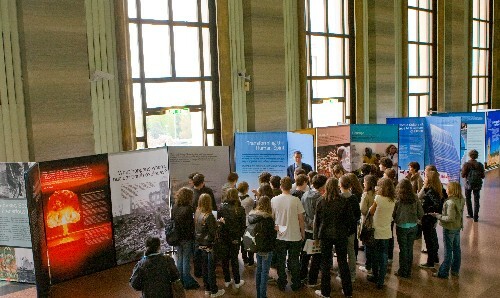 Translated into 5 languages, and slated to be traslated into 5 other langugaes, the exhibition has been shown in more than 200 cities in 23 countires and territories; venues include the New Zealand Parliament in Wellington, Yale University, Oslo City Hall, the Palais des Nations during the NPT PrepCom in 2008 and the Mexican Senate Building during the 62nd Annal DPI/NGO Conference. 2) DVD titled "Testimonies of Hiroshima and Nagasaki: Women Speak Out for Peace"
In 2005, the Soka Gakkai Women’s Peace Committee in Japan filmed the interviews with 31 female war survivors from all over Japan. They also compiled eight A-bomb survivors out of those interviews in a DVD for educational use in 2007, which has been made available in 5 languages. To deliver a shared voice of youth in Japan to the 2010 Nuclear Non-Proliferation Treaty (NPT) Review Conference, Soka Gakkai youth members in Japan launched this petition campaign in January 2010 and gathered 2,276,167 signatures. SGI youth members in 6 countries, namely Japan, South Korea, the Philippines, New Zealand, the US and the UK, conducted a total of 4,362 interview surveys from teens through 30s and release the findings at the 2010 NPT Review Conference. SGI has produced a pocketbook of the Declaration and Programme of Action on a Culture of Peace (A/RES/53/243) as well as a bookmark of the definition and eight action areas of a culture of peace upon request of Ambassador Anwarul K. Chowdhury, Chairman of the UN General Assembly drafting committee mandated to negotiate the UN resolution. These materails have been widely distributed. SGI-USA has set up the Culture of Peace Resource Centers at its community centers in New York, Los Angeles, Hawaii, Chicago and Washington, DC, with the aim of promoting a culture of peace further into society. The Culture of Peace Distinguished Speakers Series was launched in 2007 with Ambassador Anwarul K. Chowdhury as the inaugural speaker and has been held in several locations. The past speakers include Betty Williams, Betty Reardon, Jeffrey Sachs, Ishmael Beah, Shigeko Sasamori, Kimmie Weeks. The lectures and discussions have been complied in a new publication titled "Voice for a Culture of Peace". The Chicago Resource Center organizes the annual "Think Peace Take Action" conference. Following the initial exhibition titled "Building a Culture of Peace for the Children of the World," launched in 2003, we contiued our effort to produce exhibitions around the theme of a culture of peace with various aspects. The "Children are the Future" exhibition was produced in 2005, the "A Culture of Peace: Artists as Peacemakers" exhibition in 2006, the "Culture of Peace and Children: For the sake of children’s happiness" in 2006 and the "From a Culture of Violence to a Culture of Peace: Transforming the Human Spirit" exhibition in 2007. The Women's Peace Committee as well as Young Women's Peace and Culture Conference in Japan has been continuing their forums for a culture of peace for many years and occasionally produce publications for a wider promotion of a culture of peace. On the occasion of the International Women's Day in 2010, the Women's Peace Committee organized a Culture of Peace Forum in commemoration of the 10th anniversary of Security Council Resolution 1325 on women, peace and security in Tokyo. 6. Exhibition "Seeds of Hope - Visions of Sustainability, Steps toward Change"
The "Seeds of Hope - Visions of Sustainability, Steps toward Change" exhibition was produced in May 2010 as a successor to the "Seeds of Change: The Earth Charter and Human Potential" as a joint initiative between SGI and the Earth Charter International to promote the UN Decade of Education for Sustainable Development. SGI participates in interreligious and intercivilizational effort at the international, national and local levels. At the UN, SGI served as President of the Committee of Religious NGOs from 2004 to 2007 and helped the formation of the Tripartite Forum on Interfaith Cooperation for Peace as well as the Infomal Interactive Hearing segment of the first-ever High-level Dialogue of the General Assembly on Interreligious and Intercultural Understanding and Cooperation for Peace. The nuclear disarmament negotiation has been stagnant after the 2000 NPT Review Conference until the international community started witnessing the new and renewed efforts such as the WSJ op-ed in 2007, Global Zero, Secretary-General's Five-Point Plan on Nuclear Disarmament, US President Obama's speech in Prague. In 2006 SGI President Daisaku Ikeda issued a UN reform proposal in which he called for a decade of action by the world's people for nuclear ablition. The proposal was directly handed to then Under-Secretary-General Anwarul K. Chowdhury, who then delivered it to the Secretary-Geneal and other senior UN officials. As some call it a sea change, there has been a dramatic increase of the topic of interfaith dialogue and cooperation taken up not only by NGOs but also among the Member States and in partnership among the governments, UN and NGOs. SGI was serving as President of the Committee of Religious NGOs and playing a cordination role for tripartite partnerships and was able to be involved in these developments. Despite all the efforts made around the world, a culture of peace is not yet widely known in the international community. That is the very reason why SGI has focused its effort on public education at the community, grassroots level through the programs reported above. And that is the very reason why a culture of peace is emphasized and discussed in the SGI Annual Peace Proposal every year since 1999. We plan to advance the People's Decade for Nuclear Abolition campaign while continuing other programs including those reported above. Global efforts to promote a culture of peace beyond the ending of the Decade should partner with schools serving as focal points. The Declaration and Programme of Action on a Culture of Peace calls on all relevant actors to: “Ensure that children, from an early age, benefit from education on the values, attitudes, modes of behaviour and ways of life to enable them to resolve any dispute peacefully and in a spirit of respect for human dignity and of tolerance and non-discrimination.” We must use this as a guideline as we foster in children the skills needed to deal with threats to life and dignity, as well as the spirit of resolving issues through dialogue rather than violence. Such efforts should involve all the places where children learn—home, school and the wider community. We must establish the means by which children develop into individuals who can be effective advocates for their own rights and dignity, as well as those of others. Children must play a key role in enabling a culture of peace to take root in society. a culture of peace in terms of values, behaviors and ways of life.